Global view of biological processes and molecular functions of HDL proteins. Proteins in total HDL and HDL3 were identified using LC-ESI-MS/MS (Table 2). Proteins detected in HDL were associated with biological functions using GO process annotations. 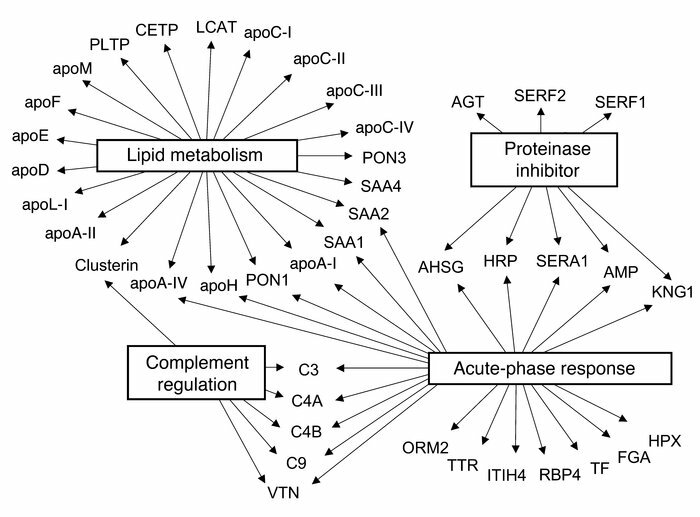 This approach demonstrated significant overrepresentation of proteins involved in several categories, including lipid metabolism (P = 2 × 10–27), the acute-phase response (P = 1 × 10–18), protease inhibitor activity (P = 2 × 10–6), and complement regulation (P = 5 × 10–5). apoH, β-2-glycoprotein I; AGT, angiotensinogen; AHSG, α-2-HS-glycoprotein; AMP, bikunin; FGA, fibrinogen; HRP, haptoglobin-related protein; HPX, hemopexin; ITIH4, inter-α-trypsin inhibitor heavy chain H4; KNG1, kininogen-1; LCAT, lecithin-cholesterol acyltransferase; ORM2, α-1-acid glycoprotein 2; PLTP, phospholipid transfer protein; RBP4, retinol binding protein; SERA1, α-1-antitrypsin; SERF1, serpin peptidase inhibitor (clade F, member 1); SERF2, α-2-antiplasmin; TF, transferrin; TTR, transthyretin; VTN, vitronectin.